Taking photographs of small, active wild creatures can appear to be quite challenging. Butterflies and dragonflies can be very active insects and often don't keep still long enough for the photographer to compose and take the shot. Birds are always wary of potential predators, so getting close enough to them to take photos without carrying huge lenses around can be difficult. However, by paying attention to the following points, successful shots can be taken. It is vital that you spend time learning about the species you want to photograph. If it's an insect, when is it on the wing? What plant(s) do the adult and larvae feed on? What habitat can you find it in? How does it behave? For insects, a lens which makes small things appear larger (a macro lens) is desireable. For birds, the requirement is quite different: a telephoto lens is needed to take photographs at long range. Whatever equipment you have, you must be totally comfortable using it. There is an old saying: Proper Preparation Prevents Poor Performance. So practise with your equipment as much as you can. You'll discard a lot of shots, but with digital cameras these don't cost money. Your aim should be to take photographs which require little or no manipulation on the computer. Fieldcraft is the art of getting into a position to photograph wild creatures without scaring them. Butterflies are less active at the beginning and end of the day, or if it's cloudy. They are likely to be easier to approach under these conditions. Birds, on the other hand, are always wary, and unless you have access to a hide you have to be patient to get your shot. Generally it is better to let the subject approach you, rather than the other way round. 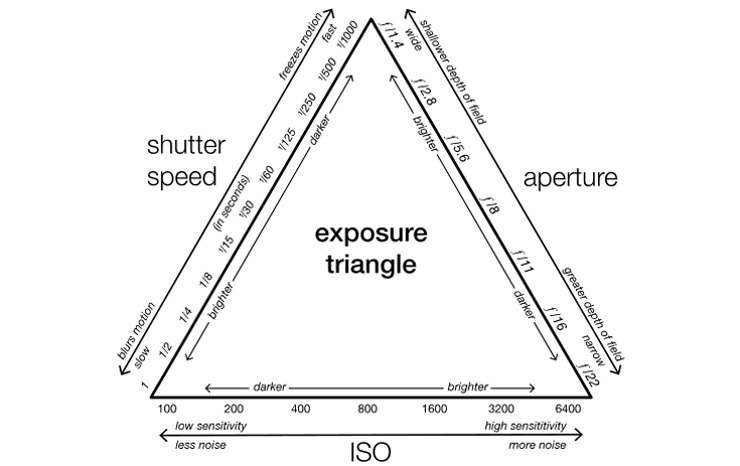 The exposure triangle is a common way of associating the three variables that determine the exposure of a photograph: aperture, shutter speed, and ISO. One must balance all three of these to achieve the desired result, as an adjustment of one requires adjustment of at least one of the others. Aperture is a measure of how much light the lens allows in. A wider aperture (or lower f-number) means more light will be let in by the lens, simply because the opening is larger. A narrower aperture (or higher f-number) allows less light to reach the sensor. Why would we want less light to reach the sensor? The answer the majority of the time is that we want a larger depth of field. Depth of field is a by-product of aperture. Narrower apertures (higher f-numbers) give a greater depth of field, allowing more of an image to be in focus. Wider apertures (lower f-numbers) create a narrow depth of field, which can help isolate a subject. The aperture can always be modified by using additional lighting, but the resulting images may not look natural. Shutter speed is a measure of how long the shutter remains open, and thus how long the sensor is exposed to light. Faster shutter speeds give the sensor less time to collect light, resulting in a lower exposure. Slower shutter speeds allow more time for the sensor to collect light and result in a higher exposure. If the shutter speed is too low to hand-hold the camera, use additional support. If you put the camera on a tripod, you freeze the motion of the camera (a cable or remote release will freeze motion of the camera shutter as well). This means that you can use a slower shutter speed, which allows the aperture to be stopped down, thus increasing the depth of field. But tripods are cumbersome to carry about, and they inevitably require setting up before the shot can be taken, so it becomes difficult to take advantage of targets of opportunity. A monopod can be an acceptable compromise. Increasing the ISO essentially allows you to work with less light (by effectively increasing the sensitivity of the sensor). As always, though, there’s a tradeoff: increasing the ISO results in increased noise and less detail. Noise is the result of random fluctuations in an electrical signal. At lower ISOs, the magnitude of the image signal is large relative to the noise (signal to noise ratio), meaning the noise generally remains unobtrusive. When working at higher ISOs, the image signal is generally close in magnitude to that of the noise, resulting in noise entering the image. So, why ever use a high ISO? Often, when working in low light conditions, you will find yourself at a point where you are using the widest possible aperture and the slowest shutter speed you can. At this point, your only choice is to increase the ISO. The lens cannot physically open any wider, and sacrificing sharpness for a slower shutter speed is rarely advisable. A number of manufacturers now make image-stabilised lenses or camera bodies. In the Canon implementation, IS works by using a floating lens element that is moved orthogonally to the optical axis of the lens using electromagnets. Vibration is detected using two gyroscopic sensors, one to detect horizontal movement and the other to detect vertical movement. As a result, this kind of image stabilizer only corrects for pitch and yaw axis rotations, and cannot correct for rotation around the optical axis. The practical effect of an IS-equipped lens is to permit the use of shutter speeds 2–4 stops slower (exposures 4–16 times longer) than would be possible with a non-IS lens. This naturally increases the depth of field. The down side is that IS lenses are expensive and relatively heavy. They also can't do anything about motion of the subject or extreme movement of the camera.